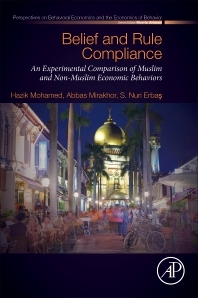 Belief and Rule Compliance: An Experimental Comparison of Muslim and Non-Muslim Economic Behavior uses modern behavioral science and game theory to examine the behavior and compliance of Muslim populations to Islamic Finance laws and norms. The work identifies behaviors characterized by unexpected complexity and profound divergence, including expectations for sharing, cooperation and entrepreneurship gleaned from studies. Adopting a unique set of recent empirical observations, the work provides a reliable behavioral foundation for practitioners seeking to evaluate, create and market Islamic financial products. Hazik Mohamed is the Managing Director of Stellar Consulting Group Pte. Ltd. which is based in Singapore. Academically, his wide research interests include behavioral investigations into human decision-making using game theory via conventional and Islamic economics perspectives. Professionally, he is currently working on blockchain-based innovations and business growth strategies for start-ups. Hazik holds a Ph.D. in Islamic Finance from the International Centre for Education in Islamic Finance (INCEIF) in Malaysia as well as M.Sc. in Finance from Baruch College in New York and B.Sc. in Mechanical Engineering from the University of Arkansas, Fayetteville. Abbas Mirakhor is the former holder of the First Chair of Islamic Finance at INCEIF in Malaysia, where he mentored and supervised 17 Ph.D. candidates, amongst other duties. He was formerly Dean of the Executive Board and retired as an Executive Director of the International Monetary Fund (IMF). He has held past professorships in Alabama A&M and Florida Institute of Technology. Mirakhor has published widely across microeconomic theory, mathematical economics and Islamic economics. He is the author, contributor and editor of numerous books, journals and articles, with much of those diverse research converging towards risk-sharing. S. Nuri Erbaş was a Senior Economist at the IMF. He also held academic positions at the Universities of Hawaii, Houston, Maryland and INCEIF. His most recent research is on Saudi Arabia’s labor markets and decision-making in ambiguity. He holds a Ph.D. in Economics from Columbia University in New York and is the recipient of 1975 Rectorate Award from Boğaziçi University, Istanbul.